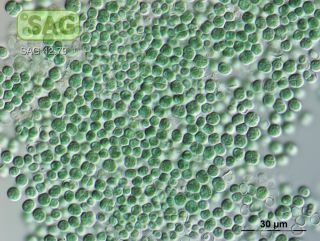 When grown in far-red light, this cyanobacteria, called Chroococcidiopsis thermalis, can still photosynthesize where others falter. An international team of scientists has found that a strange type of bacteria can turn light into fuel in incredibly dim environments. Similar bacteria could someday help humans colonize Mars and expand our search for life on other planets, researchers said in a statement released with the new work. By studying the physical mechanism behind these organisms' absorption abilities, researchers are learning more about how photosynthesis works — and raising the possibility of using similar low-light organisms to generate oxygen in places like Mars. "This might sound like science fiction, but space agencies and private companies around the world are actively trying to turn this aspiration into reality in the not-too-distant future," Elmars Krausz, study co-author and a professor emeritus at ANU, said in the statement. "Photosynthesis could theoretically be harnessed with these types of organisms to create air for humans to breathe on Mars. "Low-light-adapted organisms, such as the cyanobacteria we've been studying, can grow under rocks and potentially survive the harsh conditions on the Red Planet," Krausz added. Researchers originally thought that a particular chlorophyll pigment, called chlorophyll f, helped capture light but couldn't directly participate in converting it into energy, according to the new work, which was released yesterday (June 14) in the journal Science. But this research shows that, in fact, the pigment does participate in energy conversion, and lets the organism pull energy from longer wavelengths than ever observed. "Chlorophyll adapted to absorb visible light is very important in photosynthesis for most plants, but our research identifies the so-called 'red' chlorophylls as critical components in photosynthesis in low-light conditions," Morton said. Not to mention, it could play a key role in the search for life beyond Earth: "Searching for the signature fluorescence from these pigments could help identify extra-terrestrial life," she said. Knowing such organisms exist on Earth not only broadens where we look for alien organisms but also suggests what to search for when we look.